Click on the bottle for larger view. Veuve Clicquot Ponsardin: a brief history of the Veuve Clicquot Champagne and its maker, Barbe-Nicole Ponsardin. Note: in late 2012, Veuve Clicquot Ponsardin was battling a hoax on the Internet involving the promotional sale of six bottles of Veuve Clicquot. “This is a hoax, beyond our control,” the company announced on its website. 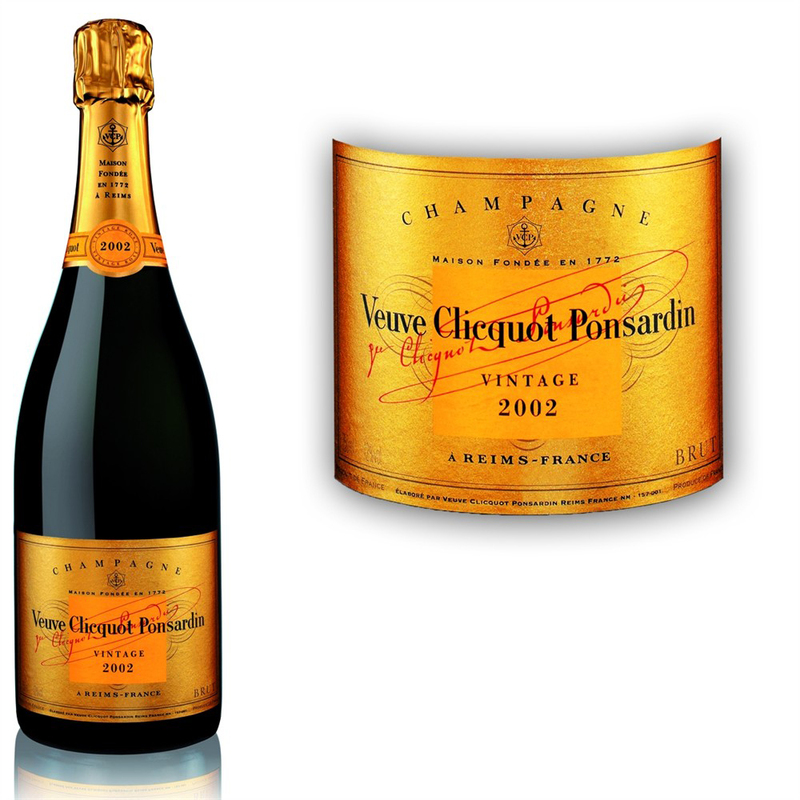 Veuve Clicquot Ponsardin is one of the world’s finer champagnes, the product of a winery founded by Phillipe Clicquot in 1772 in Reims. The champagne as we know it today is actually the progeny of Philippe Clicquot-Muiron’s wife and widow (Veuve is French for widow), the rotund Barbe-Nicole Ponsardin, who, on Philippe’s death in 1805, possibly from suicide–business was slow–took over the winery when she was 27 and, as a single mother, not only turned it into the successful and noble enterprise it’s been since, but played a key role in transforming champagne from the cloudy product of fermentation it had been until that time into, eventually, the clear bubbly we know today. In short, she was the mother of the méthode champenoise. As of late 2009, the Veuve Clicquot imprint–which includes Moët & Chandon, Dom-Pérignon, Mercier, Veuve-Clicquot, Ruinart, Krug and Montaudon–annually shipped 16 million bottles worldwide. Barbe-Nicole’s success is remarkable given the early 19th century’s oppressive, Napoleonic expectations of women, which were indistinguishable from today’s regressive, patriarchal societies that expect their mothers to stay home, rear children and keep quiet. None of that for La Grande Dame. “The world,” she wrote a great-grandchild in the 1860s, “is in perpetual motion, and we must invent the things of tomorrow. One must go before others, be determined and exacting, and let your intelligence direct your life. Act with audacity.” In 2008, Collins/HarperCollins published Tilar Mazzeo’s biography of Barbe-Nicole, The Widow Clicquot: The Story of a Champagne Empire and the Woman Who Ruled It. In 1972, the company established the Veuve Clicquot Business Woman Award as a tribute to Madame Clicquot. (The prize is a silver trophy shaped as a La Grande Dame bottle, a special vintage produced from the vineyards exclusively owned by Madame Clicquot during her lifetime.) The award has since come to be regarded as the Oscar of women entrepreneurs and business leaders, witha particular emphasis on social responsibility. In 2009, Natalie Killassy, Founder and Managing Director of South African Company Stitch Wise, was awarded for her innovative creation of mining safety tools to greater protect miners in South Africa, along with the establishment of an empowerment trust where amongst other subjects, literacy, computer skills and basic business skills are taught . In January 2001, Cecile Bonnefond became only the second woman to head the enterprise as the Chairman and Chief Executive Officer of Veuve Clicquot Ponsardin SA and LVMH Moet Hennessy Louis Vuitton (which bought Veuve Clicquot in 1987). Bonnefond left Veuve Clicquot in October 2009 to take over Le Bon Marché department store company. She was replaced by Stéphane Baschiera, who joined LVMH in 1996 as sales director for Champagnes & Spiritueux Associés. 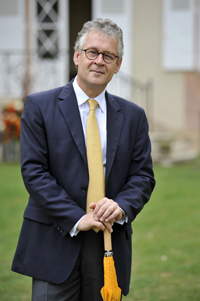 He was President and CEO of Champagne Ruinart from january 2007 until october 2009 when he became CEO of Champagne Veuve Clicquot. In 2010, Christian Ekstrom, a Finnish diver, discovered a trove of champagne bottles in a two-masted schooner that sunk some two centuries ago in the Baltic Sea. Some were Jacquesson champagnes, and some were Veuve Clicquot. The name Werle was branded into the bottom of the cork, a reference to Édouard Werle, who took over the winery in 1830, which suggests the champagne was made after 1831. “The Champagne was probably en route to the court of Czar Alexander II in St. Petersburg when the wooden cargo vessel sank,” The Times reported. “Though the exact age of the Champagne is not yet known, it goes up against tough competition in the oldest Champagne category. The Champagne house Perrier-Jouët claims that its vintage of 1825 is the oldest recorded Champagne in existence.” Until then, Veuve Clicquot’s oldest drinkable bottle was from 1904. Experts estimated the discovered bottles could fetch $70,000 each at auction, exceeding the previous record of $21,200 for a 1928 Krug, auctioned in 2009 in Hong Kong. I love champagne along with some chocolate bonbons/truffles. Ditto Palmcoaster I agree on the bonbon/truffles. I still would like a bottle of Veuve Clicquot to ring in the new year but it may be really hard to find at a good price………………………………. PJ, if money is the deciding factor, save your money – there’s no difference in taste. Asti and Baci Perugina fits into my budget, romantic sentiments included. Kip, pâtés de foie gras is fine with me if fully cooked – a faux pas among the high proles. I’ve had the raw chopped-up mush once and have no desire to repeat the experience. I love chicken livers cooked in garlic, onions, and peppers. I wonder what brand of champagne Obama’s 13 million + unemployed will be drinking this New Year??? Perhaps MD 20/20 @ $2.99 per bottle (aka “Mad Dog”, for all you champagne connoisseurs out there). Dear Liana: that we like something doesn’t mean our budgets can afford it now…In the past good economic times between 1993 and 2000, then we did. Regarding soap operas looks like you are familiar with those. As per myself I never had the time raising and educating my children back then while working more than one job until I started my own businesses over 23 years ago. Then as a business owner, research, competitive bidding and preserving the wellness of my employees consume all my time. If any free time is left will be totally dedicated to my physical fitness and not couch “potatoing”. As far is libation as well switched from Chandon to Korbel. Not that my years of savings can’t afford it, but in nowadays America will make me feel sickly guilty to uncork it! @ Doug I disagree with your 13 millions “Obama’s unemployed”… as in reality the one that open the flood gates of this uncontrolled economic disaster was the Bush administration in 2007 and 2008 and Obama has not been able to gain the vote of support to shut these gates off. For worst he wasted the first two years trying to sleep with the enemy…and I sure resent that! Until we stop the outsourcing ourselves buying and demanding Made in the USA only or Made in countries like Canada and Mexico that our two biggest buyers of our manufactured products, nothing will be resolved and greed will continuo undermining our economy and robbing our jobs.! http://wholesalers.about.com/od/importexportstart/qt/How-To-Import.htm. Other than bashing Mexico so much why don’t we all see the good trade partner they are, at least? Dear Palmcoaster, I did not mean to suggest that you watched soap operas or was a couch potato, merely assuming that you bought the bonbon for your wife or sneaked a few of hers and liked them. It was just another of the usual stereo type that I was parroting – bonbon is to soap opera as hotdog is to baseball, as tailgate is to football, etc. I never got into soap operas though I’ve watched a few out of curiousity. I am glad that you were there for your children and was/is a strong presence in their world. Dads are equally as important in their kids lives, in my opinion. Have a Happy New Year – and stay blessed. Be careful with the buying and made in America lable. Ever heard of the Marianas Islands? It ain’t Bush’s fault, It’s Obama’s. p.s. You have a lot to say and sometimes I read it. Why sometimes? You need to use more paragraphs (please, this is constructive comment) to make it easier for everybody to read. Have a Happy New Year and may it bring new hope and real change for all in November. did I mention something about a budget? As long as the champagne does not taste burnt I’ll enjoy it. Thanks for your review of bubblees………………………..Oh yes Happy New Year!!!!!!!!!!!!!!! Lucky you PJ. Living on a budget means living within ones means you know. Happy New Year to you too! You need to tweak the history a bit. Phillipe, the father, founded the company. His son Francois takes over in the 1790s and marries Barbe-Nicole in 1798. Francois dies in 1805 and Barbe-Nicole then approaches her father-in-law about taking control of the company. I think you’ll find that the sales figures you quote of 16 million bottles for Veuve Clicquot including other brands such as Krug, Moët & Chandon, Dom Pérignon etc are incorrect and are way under-estimated. The brands mentioned ( with the exception of Montaudon which has been sold to a third party) are all part of the Moët Hennessy stable which, in turn, is the wines and spirits arm of the Louis Vuitton Moët Hennessy luxury brands group. Veuve Clicquot is not the lead brand and all the champagne brands are marketed separately. Moët & Chandon is the biggest selling brand and sells over 30 million bottles although this does include Mercier and Dom Pérignon. The Veuve Clicquot brand sells around the 16 million bottles you mention and Krug would be at about 700,000 bottles, but thislast figure is only my guess.